"Not Even Death" is a short film of six minutes from Gimme Credit Films. This short had a showing at The Oklahoma Horror Film Festival in September, with details (here). The film will also have a showing at Los Angeles' Screamfest later this month and "Not Even Death" involves more zombie romance. This time the relationship is between a regular mortal and a wife who has turned undead. The husband brings home the bacon, or in this case cow brains to his insatiable and very hungry and very dead wife. However, she who would rather eat something a little tastier and much bigger, regardless if she is related to her meal by blood or not. This film was a delight to watch and the twist is dark and tragic, which is suitable to a horror short. A little more time could have been used to develop the source of the plague, the effects of the disease on a wider scale, but the small story creates intimacy between the characters. As well, this is the first love story between a man and an undead woman this reviewer has seen; so, there is some suspense and intrigue housed within the reels. 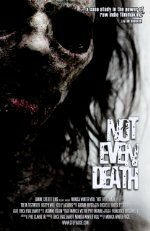 Short, well-written, and involving a family torn apart by an undead disease, "Not Even Death" is a fun watch and worth your time; the make-up effects are especially well done. Also the LA Screamfest begins October 8th and horror fans are encouraged to attend and while you are there, check out Monica Winter Vigil's "Not Even Death." More details on Screamfest and the film are all here.